Welcome to BioCity Campus Leipzig! We are pleased to welcome you to the BioCity Campus website. Take a look around and discover new possibilities in the fields of biotechnology, life sciences and healthcare on the Old Trade Fairgrounds in Leipzig in the heart of Germany. Enjoy getting to know us on the following pages. With the relocation of the Leipziger Messe (Leipzig Trade Fair) to the north of the city, new opportunities for science and research arose in the southeastern part of Leipzig. 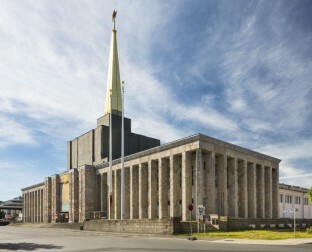 Thus the Old Trade Fair (“Alte Messe Leipzig”), with its centuries of history, now offers generous spaces and exhibition hall areas for diverse uses and almost every kind of commercial activity. Usage of the unique developmental dynamic of the biotech-oriented life sciences fields that have located themselves at the Old Trade Fairgrounds. Development of a typically urban building ensemble that provides, as a “technology campus”, a high level of identification for those already established there, while also increasing the national recognition factor. Inclusion of the urban-public sphere in the technological development of the life sciences sector; young people in particular should be drawn to the natural and engineering sciences. Designing innovative use and development concepts and putting them to the test. Development of new, unconventional collaboration structures between politics, science and civil society in the context of urban development. We know all about the importance of a strong network. Here at the BIO CITY Campus, you benefit from partners who will welcome you with open arms. 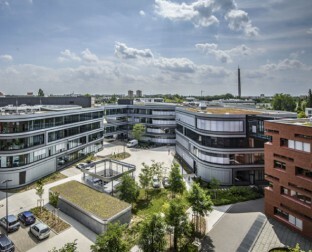 The BioCity Campus is the biotechnology and life sciences park located on the historic grounds of the Old Trade Fair (“Alte Messe Leipzig”) close to the city center. The area hosts a biotechnology and biomedical cluster capable of incorporating the benefits of neighboring research facilities that will continue to support resident businesses through a targeted extension of the value-creation chain. We can offer you fully-developed and individually customized plots of land with excellent infrastructure connections.